Portion Scoop for Zuma organic, thick and white hot chocolates. 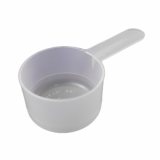 Scoop has a capacity of 43cc = 40g portion which make sa standard 12oz serving. So you can make sure you're getting the very best value out of our tins of Zuma Hot Chocolate, use one of these handy little portion scoops, just to make your life that little bit easier! NOTE: Zuma dark, original, fair trade and double all use the small size 32cc scoop.